Show your appreciation for your child's coach with this one-of-a-kind gift. Your design will be personalized with your team's information and colors. I EDIT, YOU PRINT! * BUYING FOR MORE THAN ONE COACH? 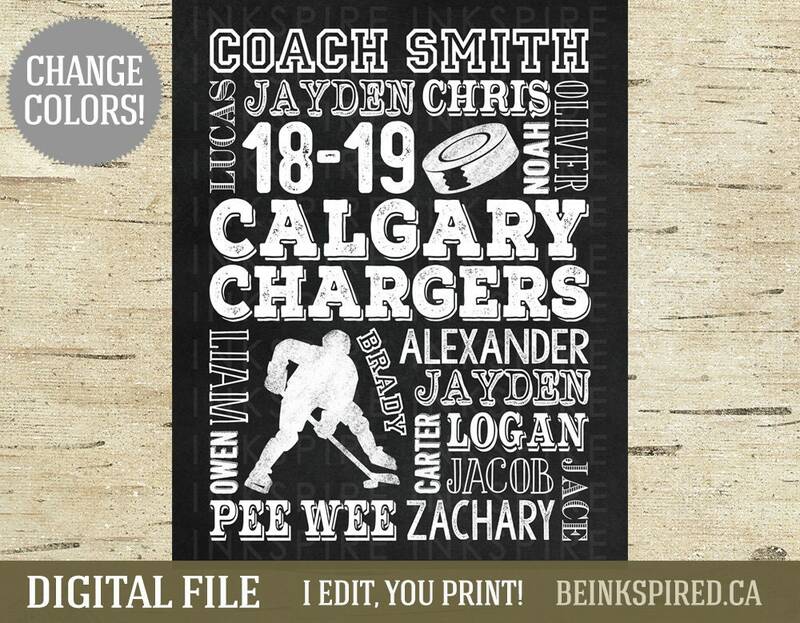 I charge $5 CAD per additional copy if the only change is the coach name. Please select the number of coaches you have from the drop-down menu upon check-out. You'll receive a copy (file) for each coach, with their name at the top. The current turnaround time from receiving your order to sending you your first proof is 1-3 BUSINESS DAYS (Monday-Friday, excluding holidays). ► Step 2: Select HOW MANY COACHES you are buying for from the drop-down menu. * Feel free to send me your team photo or logo to color match! * If you are buying for more than one coach, please specify the number of coaches (copies) you need from the drop-down menu upon check-out. I charge $5 CAD per additional copy if the only change is the coach name. ► Step 7: A proof will be sent to you within 1-3 BUSINESS DAYS of receiving BOTH your order and the information for your design UNLESS you have paid to RUSH your order. ► Step 8: Once you approve your design, your files will be e-mailed to the e-mail address listed on your Etsy account along with some printing recommendations. Your files can be printed at any print shop (e.g. Staples, Office Max) or any photo lab (e.g. Walmart, Costco, etc).